Oil prices seeming to whipsaw back and forth, weekly, daily, even hourly is the result of many oil and options traders clearing trades at whatever slim profit they can eke out. Of course, multiply that slim profit by the huge volumes traded and well, Wall Street still makes a hefty profit whether oil is up or down. Other folks are starting to talk about oil supply and demand hitting a new equilibrium, or that shale production has peaked. Fair enough. In fact, I agree that efforts to constrict oil supply are starting to have some effect. I doubt however that restricting oil supplies will be effective in the long run. OPEC claims that compliance with the production quotas is strong, but on the other hand, some OPEC members have recently vowed to opt out of the quotas and to even increase production. Don’t forget about some of the African members of OPEC who were free to pump and sell as much oil as they could. Also of interest is the sudden tanker buying spree that both Iraq and Saudi Arabia have embarked upon. For Saudi Arabia, 61 VLCCs carry a lot of oil for delivery – or as a storage buffer. Oil markets themselves are shifting operations. What used to be a negotiated long term contract between parties has now morphed into an auction type clearing house. Back room special rates to China or Japan be damned, it appears to be fair market value from now on. Auctions are great for relatively high spot prices, but watch out if spot prices fall. These events and others too numerous to mention here seem to suggest that we’re about to enter a Revenue Trap for oil. That is, most major oil producing states are desperate for revenue and are already abandoning the quotas, finding ways to manage distribution, storage and delivery, and whatever way possible to eke out any price gain for oil. Once the Revenue Trap takes hold, it is unlikely that oil will ever hit $100 again in the foreseeable future. 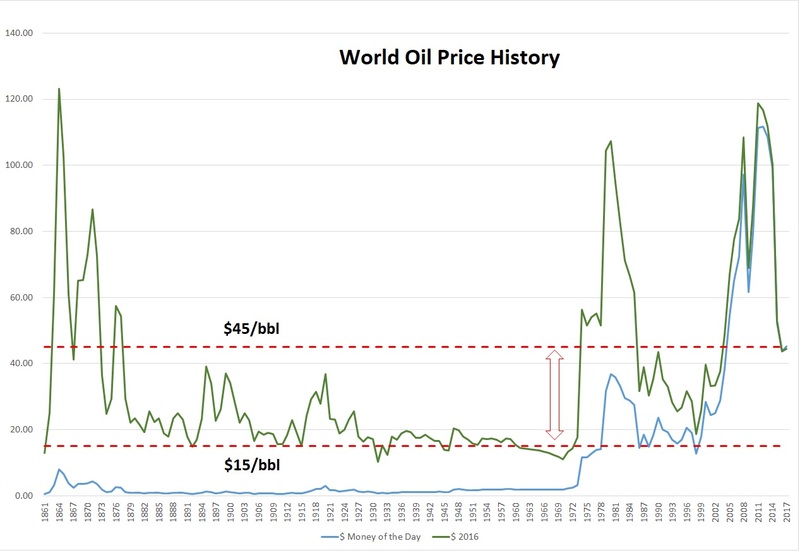 Instead, I think that oil prices will again settle within a range of their long run prices (see figure below). In addition, everything that the oil producing states do to push prices up are only going to drive the oil consuming states (China, India) to seek ways to do with less and less oil. The affordable technology to replace oil is here, and in China and India the political and social will to do so is there. Europe? They have set plans in several nations now to abandon petrol vehicles or gas heating. North America? Well, the U.S. is fractured and Canada of course is just going with the flow . All these technology changes and possibilities are causing oil industry executives and workers in Houston, Riyadh, Moscow and Teheran worry about oil prices or jobs, yet traders in New York, London and Singapore worry whether their next purchase will be a Ferrari or a Tesla. 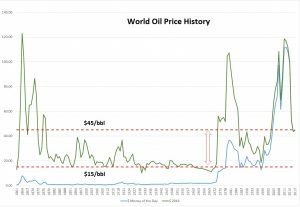 Low oil prices have three benefits: 1) they cancel the bad projects, 2) they bankrupt the dumb companies and 3) they overthrow the corrupt and inept governments. We need oil just a bit lower for a bit longer to really do some good in this world. Forget hugging trees, embrace the sunshine and feel the breeze in the air. Remember also to keep your tires properly inflated and just maybe, after Venezuela, a few more inept governments will fall (I’m looking at you Canada!). The best Guarantors of Liberty, Equality and Fraternity are financial and energy independence. Previous PostThe Transportation Transformation and its Impact on the Oil IndustryNext PostNet Metering: A brilliant concept whose time has passed?